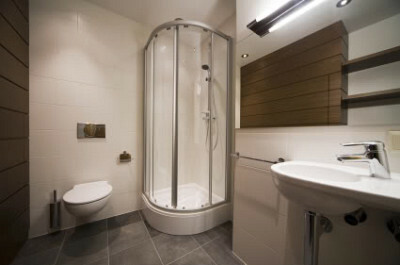 Bathrooms tend to be the smallest rooms in most houses. They can also be expensive to remodel. I remember reading recently that the average cost to remodel a bathroom is between $11,000 and $15,000. If that room is only 35 square feet, that comes out to about $350 a square foot. Why so much, you might ask? The answer lies in the amount of stuff that is squeezed into such a small space. It’s not too difficult to spend $800 on a tub, another $600-$800 on a vanity and sink combo. Throw in some fancy lights, faucets, etc. and you can see where this might end up. If you are paying a plumber, an electrician and a top-notch tile setter, your labor cost can soar quickly as well. Having the time and skills to tackle a project like this yourself can save you hundreds if not thousands of dollars. Here are some tips to keep your small bathroom remodeling project in check. A basic 3-wall tub enclosure (3’x 5’) will use just under 80 sq ft. of tile. Compare this to an average two-wall shower enclosure at just under 50 sq ft. and you already have close to a 40% savings in the tile itself. If this is being installed for you, your labor cost for that install should also go down by an equal proportion. A similar relationship applies to the flooring as well. You'll pay less to tile a shower than you will a bathtub. If your small bathroom remodeling project uses basic porcelain or ceramic tile that you found at nice price, compared to high-end granite or marble, you can also save considerably. I have installed some very attractive porcelain tile that cost less than $5 a foot; I have also installed exotic, imported granite and marble that was close to $30 a foot. Does it really matter? To some yes, to you… maybe? Keep this in mind when you are shopping for tile. One way a small bathroom remodeling project can go a little easier on the pocketbook and provide enhanced appeal is with the use of a pedestal sink. If your plumbing supply and waste lines are clustered, you can often install a pedestal sink without plumbing modifications. A pedestal sink provides an uncluttered, lightweight feel to a bath. You will lose the storage space that a typical base cabinet provides, but the open feeling that pedestal sinks provide more than makes up for it. Pedestal sinks come in a wide range of sizes to fit all types of rooms. Shop around to find what might work best for you. 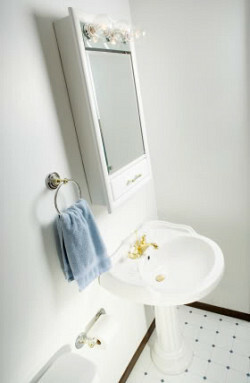 Pedestal sinks are often wise choices for small bathrooms. The $350 per square foot that I mentioned above is an average. I have completed a handful of bath remodels that have come in at less than half that number, labor included. What raises the average is the monster bath with swanky tile and top-end fixtures; I have seen free-standing soaking tubs that list for $10K or more. The trick to a reasonable small bathroom remodeling project is to keep the materials in check, and work in stages if your budget is tight. Get some ideas for your small bathroom remodeling project. Discuss them with a professional remodeler. Find a qualified remodeling contractor near you.